Love volunteering? How about education and language-learning? At a 2-day workshop, starting on Saturday at 9:30 AM, you can become a basic literacy tutor for LCNV. To sign-up: email Belle Penaranda, volunteers@lcnv.org. At 10:00 AM on Saturday, take a walking tour with DC Councilmember Tommy Wells, discuss the future of the H Street Corridor, and explore several major redevelopment projects. Plus discover all the small businesses cropping up on H Street. We’re psyched to introduce … Tamara Wilds Lawson, director of Posse DC. The Posse Foundation, which has grown to eight sites across the country, identifies public high school students with extraordinary academic and leadership potential and send them to college in supportive teams (or” posses”) that act as traveling support systems. We are currently in the final push for our annual Power of 10 fundraising event taking place on October 5, 2011, at the Woolly Mammoth Theatre here in downtown DC. The event will highlight our Posse Scholars and our programs, which both prepare them for and help sustain them through their collegiate experiences. We will also honor Barbara Harman, The Catalogue for Philanthropy’s dynamic president and editor. This is a busy time of year for Posse DC because we have started our Dynamic Assessment Process (DAP), which is the unique way we identify the talented young leaders from area high schools we will send to top colleges and universities across the country on four-year full tuition scholarships. This fall, we have already interviewed over 1,000 potential Posse Scholars. Most recently, my exposure to the talented young people participating in programs at the Southeast Tennis and Learning Center motivated me to seek fulfilling work that would highlight the kind of intellect and capacity for excellence they consistently exhibit. I am thrilled that The Posse Foundation, which has been providing opportunities for incredible young leaders like them to go to college for over 20 years, through the vision of its president and founder Debbie Bial, is the perfect place for me to do just that. Reggie Van Lee, who is an Executive Vice President with Booz Allen Hamilton where he leads the firm’s not-for-profit and public health businesses, is a phenomenal leader in the philanthropic world! Although he has a national profile, which he developed over the course of a 25 year career in which he has helped transform public and private organizations, he is personally involved with several local projects in New York City and Washington, DC. He is beloved in DC because of his unique ability to see the intrinsic value of productive non-profit organizations, regardless of their size, and support them unconditionally. I am inspired by the breadth of organizations and lives he has transformed on a national and local level. One of the biggest challenges we face as an organization is that there is an overreliance on standardized test scores by many institutions of higher learning — which leads to countless capable, dynamic students being overlooked. As a result, we find that the demand for our Posse leadership and merit scholarships far outweighs our capacity to provide opportunities for all of the great young people we encounter to get a college education. 6. What advice do you have for other people who want to work in your field? Chose an organization doing work you are passionate about because that passion will help sustain you when the work becomes intense and your responsibilities seem daunting. My advice for future directors is don’t underestimate the importance of hiring a strong team of professionals who are a good fit for the organization and consistently supporting them once they’re on board! As the new Posse DC director and a native Washingtonian, I am looking forward to building new partnerships with local organizations and strengthening our existing relationships with key supporters. EXTRA:?If you could have a power breakfast with any three people (living, dead, or fictional) who would they be? Ella Jo Baker, Ida B. Wells-Barnett and Frederick Douglass. This Sunday, parents read picture books aloud in the children’s room, teens lined up to use a mini-recording studio, and anxious Internet seekers checked a waiting list for computer access that was maxed out at 50 names. My people are American, my time is today [...] music must repeat the thought and aspirations of the times. So … what would you like to do in this final weekend of September? Enjoy a Taste of Arts, complete with festive music and dancing, to benefit the Alzheimer’s Family Day Center tonight (Friday) at 6:00 at Westwood Country Club in Vienna. On Saturday at 6:30, ASHA for Women (Asian Women’s Self Help Association) hosts their annual gala dinner in Fairfax; learn about Hope Through Empowerment here. And on Sunday at 11:00, Sexual Minority Youth Assistance League (SMYAL) will hold their 14th Annual Fall Brunch at the Mandarin Oriental in DC; you can support LGBTQ youth, who face discrimination everyday in their homes, schools and communities. This is the second post in a two-part series by Jade Floyd. Ms. Floyd works in international public affairs in DC and serves on the Board of the DC Arts and Humanities Education Collaborative. Follow her on Twitter: @DcThisWeek. Read the first part of the series here. Attention, Catalogue nonprofits. This morning, we wanted to give you an extra boost of encouragement to enter our 2011 Video Contest — if you have not already done so. (In which case, thank you and good luck!) We’ve just extended the deadline to September 29. So here’s the deal. No need to have a multi-camera, crazy cinematography production. You are more than welcome to create the video on your phone or laptop in one shot. Think compelling, simple, and 2-minutes in length. This year’s topic is Heroes and Heroines. More specifically, what person’s spirit and energy and determination encourages you to do what you do every day? The top three (heroic) videos will be screened at Inspiration to Action on November 7, 2011 and … the nonprofit with the winning video will receive a $1,000 prize. Cool, yes? Voting is open to everyone, do encourage your friends and supporters to vote for you. Full instructions are right here. And check out this video from Catalogue President Barbara Harman to learn more. Hope that you enjoyed the fall weather this weekend! This month, let’s check out another cool feature of the online Catalogue: creating your own Catalogue account. – Saved Favorites: create a list of your favorite Catalogue nonprofits, so you easily can check back for opportunities to volunteer or donate. – My Catalogue: print your own catalogue of the nonprofits that interest you most. – Donation History: track up to three years of donations (we’ll archive the rest), so you have an easy record for tax and personal purposes. – Especially for Kids: check out our list of charities that are particularly cool for kids — from those working to save the environment to those giving kids access to dance and theater. 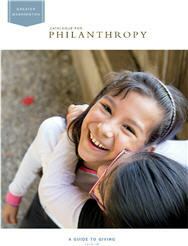 Kids can also pick their favorite nonprofits and make their own Catalogue. So sign up and start exploring!